Well, the offices never looked like this when I worked at Macmillan. Last night, Nature Publishing Group unveiled the new enhanced Macmillan presence in virtual world Second Life at a champagne and canapé fuelled launch in London. One of the questions raised in the discussion afterwards was ‘should we make virtual worlds more – or less – like real life’? I’m very pleased to see that the new islands aren’t modelled on an industrial estate in Basingstoke. In fact, the Elucian Islands (not to be confused with Random House’s Elysian Isle), are rather lovely. I had to read the email twice to realise that the launch was in Real Life. As anyone who has spent any time in SL will know, we quickly come to think of it as a physical place where one attends events. 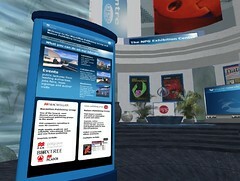 The RL event, however, did had a live video link to attendees in SL. We could see the Khufu Conference Centre full of avatars; they could see the speakers in London on an in-world video screen, and take part in the Q&A. Nature’s business model includes hiring out virtual meeting rooms and conference facilities, and inviting sponsorship – some of the ways you can directly monetize your SL presence, in addition to using it purely as a marketing means to sell stuff. I think Second Life is still a bit of a niche network for nerds, fascinated as I am by it. But it will become more mainstream. It already is in terms of press coverage and public awareness. Less so when it comes to actual usage, though there are some large communities of interest that can be tapped into – including scientists and writers. If SL is a place where your community hangs out, then so should you. Inspired by the launch, I made a long overdue visit to SL when I got home, mainly to take a few photos to post here (see the Publishing Talk Flickr Group for more). I had the strange experience of seeing my name in some sample virtual pages from The Writer’s Handbook , in which I have a short chapter. Then I bumped into my old SL friend Jilly Kidd (quite literally, since I’d almost forgotten how to walk after such a long absence). She organises a lot of writing groups and events, and hosts the Meet The Author show on SLCN. The biggest SL writing event of the year is taking place this month, the Autumn Writer’s Exhibition, organised by Jilly and Hastings Bournemouth. You see? Networking in SL works. I’ve made some new connections, found out about an event, and joined some new groups, including the SLociety of Authors. So, if you’re a writer – or a publisher – who has put off setting foot in SL so far, this is a good time to join. Hope to see you in-world soon! Hi Jon. It was nice to ‘bump’ into you again as my avatar Jilly Kidd and thanks for mentioning our Autumn Writers’ Exhibition. One thing that has come out of the AWE this year is that we’ll be including publishers more on our own area – giving some publishers a free small store and office there. This will let them link from our high traffic area for writers to their own sim too. We’re giving this opportunity to publishers who offer writers guidance on how to submit manuscripts or who offer ways of submitting, and we always welcome talks from publishers whether or not they are on our area. Cinnamon Press has already taken up the offer and we’re also talking to Macmillan, eHarlequin and Bluechrome, as well as an innovative US company called Flying Pen Press which takes submissions directly online. Apart from the offer of a store for publishers who can give back to the writing community in this way, I also talk to publishers about any of their authors willing to come in-world. They can appear on the Meet an Author show which is seen by people whether or not they are on Second Life by going to http://slcn.tv and I’ll help authors coming in-world for the first time. Any published author who comes into Second Life can contact me to appear and it’s a lot of fun. Contact me as Jilly Kidd inworld or adele@writtenword.org.uk to arrange any of these things. Not sure I agree it’s for nerds – it’s a great place for writers! because I am sure it will be published. Cookie is home to a large number of writers and performers. We are very much interested in developing connections that will bring our people in contact with “Real World” opportunities.